AOL Instant Messenger (AIM) and AIM Express are both discontinued services and are no longer functioning. This article is archived because the services are no longer relevant. 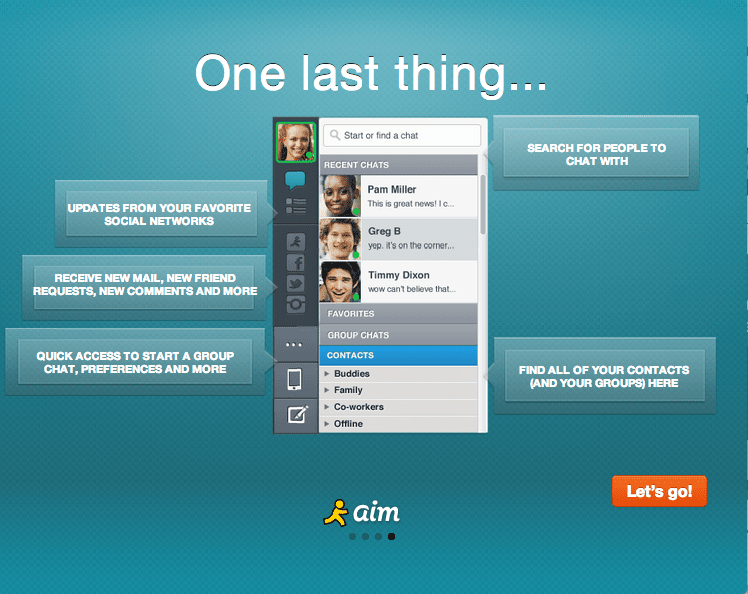 AOL Instant Messenger (AIM) supports instant messaging and file sharing on computers and mobile devices. Updated versions of AOL Instant Messenger client software are released on the web frequently. Additionally, AOL offers a second application called AIM Express that allows access to the instant messaging functionality through a web browser instead of the offline AIM client. AOL Instant Messenger 7.5: The download links here at OldVersion.com lets you get AIM 7.5 and older versions since they're no longer available from AOL's website. AIM.com: Use AOL Instant Messenger website at AIM.com to avoid having to download the client app. What is AIM and Where Do I Access It?